You can find the Assistant in your Utilities folder, which is in your Applications folder. Use Launchpad to reach it quickly: Click the Launchpad icon on the Dock, click the Utilities folder icon (sometimes called the Other folder), and then click the Boot Camp Assistant icon. Click Continue on the Introduction screen. 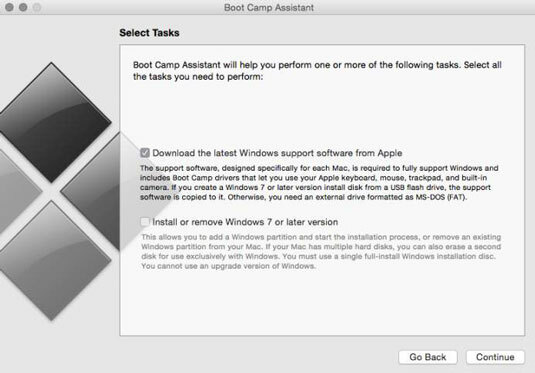 The Boot Camp Assistant Support Software screen that appears. Make sure the Download the Latest Windows Support Software from Apple check box is selected, and click Continue. Boot Camp Assistant can copy these drivers to a blank CD or DVD or an external USB flash drive. A disc (which you can hang on to in case you need it later) is the easiest choice, but most current Mac models no longer have an optical drive, so the USB flash drive may be a better choice. You load this software after your Windows installation is complete, and it provides all the drivers that Windows needs for your Mac’s hardware. Choose the size of your Windows partition, and click Create. You may be prompted to launch the assistant again. Click Start the Windows Installer, and then click Continue. From this point on, you’re running the Windows installation program, just as you would be if you were using a PC. (Well, actually you are using a PC now.) Follow the onscreen prompts, which differ for each version of Windows. After Windows has been installed, load the disc or USB flash drive you created with the drivers and support software. Windows should automatically run the Boot Camp driver installation program for you. After the drivers are in place, you’re ready to do the Microsoft dance. Are you moving your stuff from Windows (running on your old PC) to . . . well, Windows (running on your Mac)? Brings an entirely new meaning to the term switcher, doesn’t it? If so, the files and folders on your existing PC can be copied directly to Windows running on your Mac by using the Windows Easy Transfer utility.